In the other match of the night, Jaipur Pink Panthers outclassed UP Yoddha 45-28. 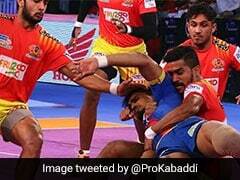 Gujarat Fortunegiants started their home leg with a Bengal Warriors 35-23 in an inter-zonal clash of the Pro Kabaddi League on Friday. K Prapanjan led the attack for Gujarat, scoring 9 raid points. He was ably supported by Ajay Kumar (six raid points) and Parvesh Bhainswal (four raid points). Bengal Warriors were in the match for the first 10 minutes but were out of sorts after suffering an all out in the first half. Maninder Singh and Jang Kun Lee couldn't live up to their high standards as the visitors suffered a second consecutive defeat. In the other match of the night, Jaipur Pink Panthers outclassed UP Yoddha 45-28. Deepak Hooda got 10 raid points for Jaipur Pink Panthers while Sunil Siddhgavali got 5 tackle points. For UP Yoddha, Rishank Devadiga got 7 raid points and Nitesh Kumar got six tackle points. Earlier in the first match, Ajay and Maninder got a couple of raid points to get their teams going in the first five minutes. Prapanjan's two-point raid gave Gujarat a 6-5 lead in the sixth minute. Both teams were jostling for points and refused to give an inch in what was a closely contested first half. Maninder scored another raid point in the ninth minute to hand Bengal a 9-8 lead. In the 14th minute, Gujarat grabbed the advantage by inflicting an all out to lead 14-11. Their defence ended the first half strongly by sending Lee and Maninder to the bench. At half time, Gujarat Fortunegiants led 19-14. A super tackle forced by Bengal Warriors in the 23rd minute reduced the deficit to four points. Gujarat, however, were in no mood to allow Bengal make a comeback. Ajay's successful raid in the 28th minute led Gujarat to inflict another all out as they extended their lead to 27-18. With less than five minutes to go, Gujarat enjoyed a healthy 12-point advantage, before picking up a few more raid and tackle points in the last couple of minutes to wrap up an easy 35-23 win.